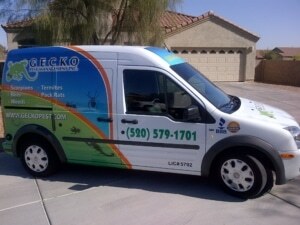 At Gecko Pest Management in Tucson, we specialize in unique desert pest problems. Our Tucson pest control services begin with value and safe practices and ends in a solution. We take into account that every home and home owner is not the same – and many desert pest control problems are unique, needing a customized solution protocol. Contact our Tucson exterminating experts today for your free quote. Contact a Tucson Pest Control expert today at Gecko Pest Management in Tucson. At Gecko Pest Management in Tucson, our priority is to provide a lasting solution to your desert pest problem, and we will put in the work to make sure your pest exterminating and pest management needs are taken care of. Our pest control services go beyond pest control. We create a personal pest removal solution for each homeowner, home, and their specific needs. Not only do we offer pest removal services — we target areas where pests could enter your home in the future, and even take preventative measures to make your home undesirable to pests. Have you ever asked your pest control technician to spray around the pool or under the patio furniture or along the back wall and they told you “I’m not allowed to do that” most likely they really aren’t allowed to do this, but its not because of a law, or the chemical manufacturer doesn’t allow it. In reality most likely their company doesn’t let them do it, either because they don’t want any increase in liability, or they want to keep material usage at a minimum or some other self serving reason. If that works for them, great, and to be honest Gecko would probably be a much bigger company if that’s the way we ran our business, but we would rather make sure the customer is taken care of first. Our Tucson pest control services are designed to do just that. Gecko Guard is our standard Tucson pest control program. It covers all insects that can be defined as “doorway pests.” No we aren’t talking about solicitors. Doorway Pests are insects that occur naturally outside that for one reason, or another, happen to slip through the doorways, windows or cracks around your home. These same insects can also be a nuisance outdoors as well without ever entering the structure, ant trails along the edge of the pool deck, spider webs accumulating under patio furniture, scorpions in the enclosed bbq can all ruin a good weekend. At Gecko Pest Management we feel that targeting these insects outside in these areas and others will help prevent them from ever coming inside: to sum it up “If we do our job outside we should never have to come inside” and its this tactic that helps set us aside from other companies. Most of the calls we receive regarding our pest control services are “How much does it cost for my home?” Understandably so as this is the driving force behind a lot of decisions in today’s economy. Once we receive that question we ask the square footage of your home or obtain the square footage from the Pima County Assessor’s (or Pinal County for some of you up there) website. We take this square footage apply it to our pricing chart and quote your Gecko Guard General pest control service this way. Here’s how you can do it also! Pretty simple really. But is this set in stone? No. But at least it gives you an idea. For the most part these prices reflect an average house, with a proportional lot size, and a generally well maintained landscape around the property. Some factors may exist that may allow us to the lower the price, while others may require us to raise the price. Some houses may need pest control or exterminating with some rodent control as well. Even factors like complexity, while most houses we can walk around, treat, look for problem areas and address them simultaneously, others we have to do all this and concentrate on not falling off the side of the cliff that’s next to the house too! The best way to know how much your pest management service will be is to call us today at (520) 579-1701! Don’t want to talk? That’s fine! Contact one of our Tucson Pest Control Experts to get your free quote.